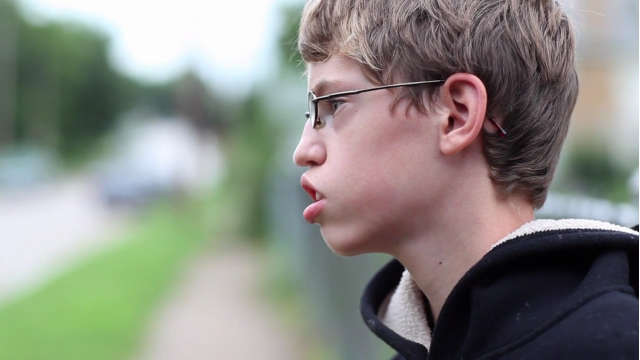 One of the five touching stories of bullied teens in "The Bully Project." With the success of the It Gets Better project, the national dialogue has been dominated by the bullying of LGBT teenagers. But the sad truth is that bullying is not limited to just one perceived minority or another. The truth is that anyone who is remotely different – skinny, fat, with glasses, disabled, or in any way not the same as those around him or her – is vulnerable for bullying. In fact, this year, 18 million kids in the United States will be bullied, making it the most common form of youth violence around. The Bully Project addresses this issue head-on. Premiering at the Tribeca Film Festival this month, and directed by Sundance and Emmy-award winning director Lee Hirsch, the film is about those kids that are not cool, and that suffer terribly at the hands of their so-called classmates. The trailer, below, is heart-wrenching and is certainly going to be the talk of the festival. The producers are building a nationwide campaign around the film, aiming to raise the bar of conversation around this epidemic of youth violence. Sign up for updates, and learn how to be a part of the conversation, at the Bully Project. You can also help fund the finishing of this project on Indie Go-Go: https://www.indiegogo.com/The-Bully-Project. Contribute and share this link if this issue hits home with you; the funds raised in the next 60 hours will go towards the final editing and finishing of the film before premiering at Tribeca in 2 weeks.